Stephanie Nouvel-Kennedy has been writing nutrition articles for more than a decade, drawing from many fields to offer a holistic health perspective. She holds a Bachelor of Science in agriculture, a certificate in Integrative Health, a 200-hour Registered Yoga Teacher Training Certification, and has completed post-baccalaureate studies in nutrition at Bastyr University. Butternut squash has many health-promoting features and a long storage life. It is an excellent source of vitamin A in the form of beta carotene. Its seeds are rich in protein, healthy fats and zinc, making a satisfying snack. 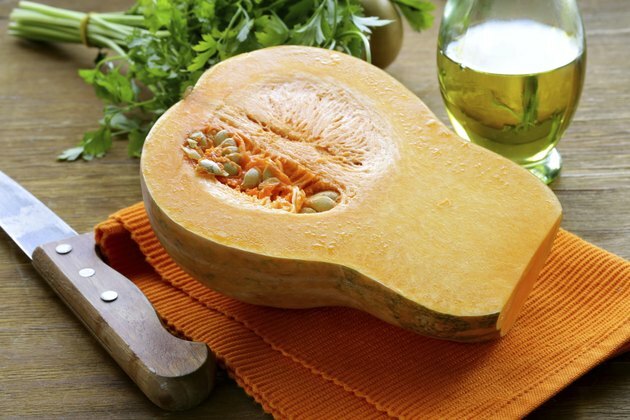 Butternut squash is a nutrient-dense food, providing much nutrition in few calories. 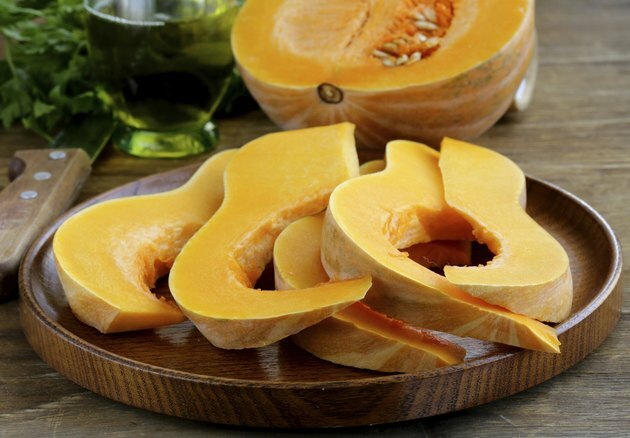 All in all, butternut squash has an ample supply of health-promoting goodness. Consuming a small portion of butternut squash's rich yellow-orange flesh supplies more vitamin A than most people need in a day; about 1 cup of cubed raw butternut squash contains 195 percent of the recommended dietary allowance, or RDA, for women and 156 percent of the RDA for men. Vitamin A is important for eye health and immune function, with deficiency causing vision problems and leading to decreased resistance to infections. A significant portion of butternut squash's vitamin A content comes from beta carotene, one of a handful of carotenoids found in fruits and vegetables. Carotenoids are converted to retinoids in our bodies -- the biologically active form of vitamin A. Beta carotene is the most studied carotenoid, associated with a significantly reduced risk of lung cancer. It also may reduce the risk of macular degeneration, UV-induced skin damage and breast cancer. While often discarded, winter squash seeds are rich in protein and mono- and polyunsaturated fats and make for a heart-healthy snack. Replacing some dietary carbohydrates with protein and unsaturated fat has been linked to improved heart health. A half cup of these seeds also supplies almost a third of the zinc RDA for men and almost half of that for women. Zinc is important for most body processes and structures, and deficiency often leads to reduced immune function. 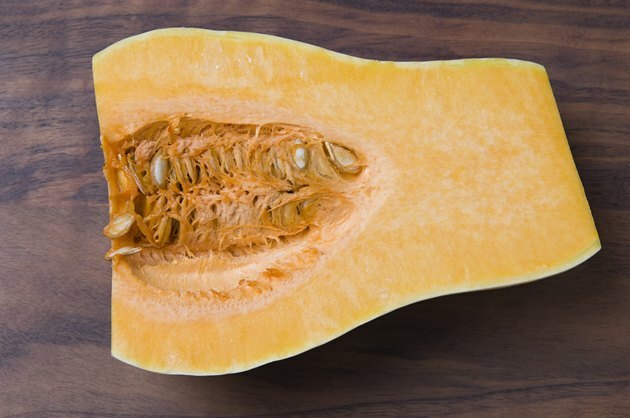 To prepare squash seeds, remove the stringy bits and toast them in the oven in a small amount of salty water until the water has evaporated and the seeds are crisp. Butternut squash supplies a variety of nutrients in significant quantities without serving up many calories. Indeed, 1 cup of baked squash cubes contains just 82 calories and yet supplies 6.6 grams of fiber, one-third of the vitamin C RDA for men and half of that for women, one-tenth of the RDA for folate, and over one-fourth of the RDA for potassium. 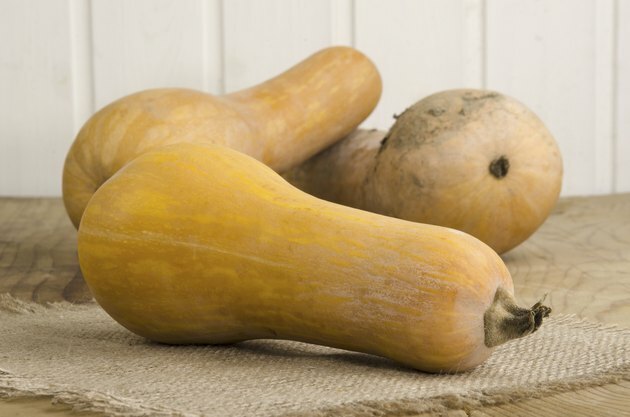 With a variety of nutrients, few calories and a sweet taste to boot, butternut squash is a dietary shoo-in. Perspectives in Nutrition, Sixth Edition; Gordon M. Wardlaw et al. University of Illinois Extension: What Are Polyunsaturated and Monounsaturated Fats? What Are the Benefits of Poppy Seeds? 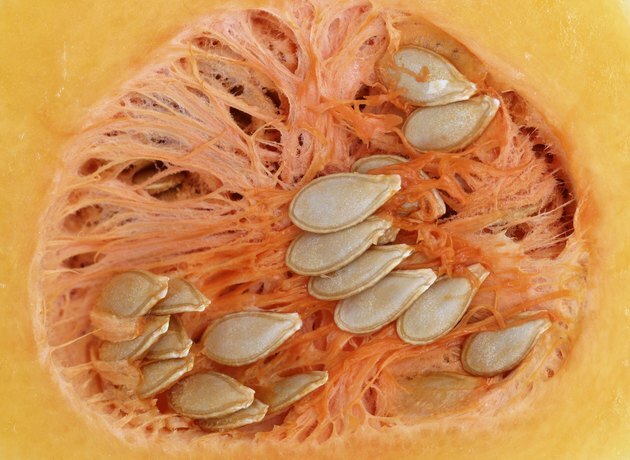 Can You Eat Acorn Squash Seeds? What Are the Benefits of Cantaloupe Seeds?